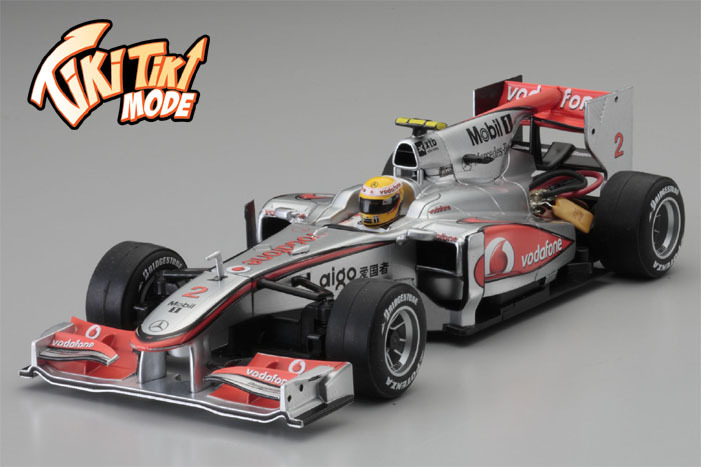 shop.tinyrc.com :: Kyosho Mini-Z F1 MF-015 McLaren Mercedes MP4-25 No.2 Lewis Hamilton Tx-Less Body and Chassis Set (2.4GHz ASF) - ON SALE! Kyosho Mini-Z F1 MF-015 McLaren Mercedes MP4-25 No.2 Lewis Hamilton Tx-Less Body and Chassis Set (2.4GHz ASF) - ON SALE! Kyosho Mini-Z F1 MF-015 McLaren Mercedes MP4-25 No.2 Lewis Hamilton Tx-Less Body and Chassis Set (2.4GHz ASF). A NEW BODY and NEW RC UNIT deliver the ultra-realistic formula racing experience from a compact palm-top sized machine. The 2.4GHz one-piece RA-23T receiver-amp control unit requires no frequency band crystals and features Chase Mode that turns up the heat of racing excitement. When used with a compatible 3-channel transmitter (sold separately), the Chase Mode acts as a power limiter to restrict output to 70% of full throttle. However, when the opportunity presents itself, push the 3rd channel button and output is instantaneously increased to 100% for a 3-second burst of speed. Inspired by the boost button on full-size formula racing machines, this new feature dramatically increases the intensity of racing action! Restricting the maximum speed actually allows better driving lines and supports easier control, but once the overtake button is pushed, the machine surges forward like a tiger in attack! However once you’re in front, you become the hunted. The lead can change numerous times during a race with much more overtaking for thrilling racing battles. Also, the Chase Mode can be set so the overtake button can only be used a certain number of times per machine (optional No.82080/I.C.S. USB adapter and computer are required). This allows you to apply a handicapping system by restricting the number of speed bursts each car can use so beginners can compete on a more even footing with more experienced drivers. Of course, the ASF 2.4GHz 2-channel transmitter for the MINI-Z Racer can be used and an optional gyro can also be installed. The gyro functions by evaluating the running posture of the model and automatically correcting the steering and throttle for smoother control making it easier to drive, especially for beginners. As this set is packaged without transmitter, it is ideal for existing owners of an ASF 2.4GHz MINI-Z Racer, making it economical as a 2nd or even 3rd model. With the power of technology in your hands, the advanced performance of this machine with Chase Mode promises the ultimate R/C formula racing experience. Pre-painted plastic body complete with graphics. *AAA-size alkaline batteries x 4 or Ni-MH batteries x 4 for chassis. I.C.S. USB adapter (No.82080) for using I.C.S. functions and Chase Mode adjustment. **Note: Overtake function may work with R246 2.4GHz module adapter but is not guaranteed with transmitters other than Kyosho or KO 3-channel transmitters. Also, the 2-channel KT-18 transmitter can be used without Chase Mode. Points Earn 224 points when you buy this product!